Many people remember Lady Gaga’s jaw dropping meat dress, so when you hear of a dress made out of fruit, your mind is not likely to think of the trendy pieces H&M is releasing next week. 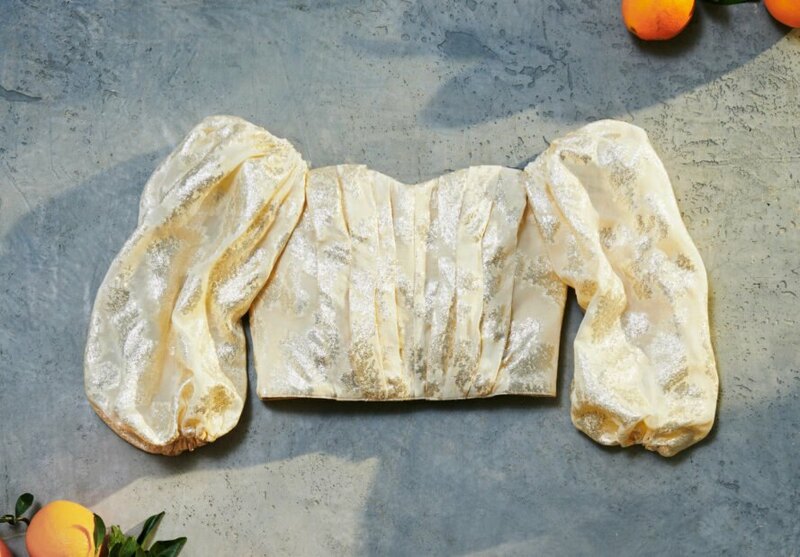 On April 11, 2019, fashion giant H&M will release its ninth Conscious Exclusive line, but this year, it has partnered with eco textile companies to make cutting-edge food waste clothing technology a global success. This newest technology in sustainable fashion includes vegan leather made out of pineapple leaves by Piñatex, a silk alternative made from orange peels by Orange Fiber and shoe soles made from algae by BLOOM Foam. All of these organic materials are readily available and otherwise considered waste by-products from the harvest of pineapples, juicing of oranges and the harmful overpopulation of algae in waterways. The materials would otherwise rot in landfills but are processed in factories so that they do not biodegrade while you’re wearing them. Like other fabrics, these eco textiles are finished with harmful chemicals that prevent the fabrics from biodegrading. That also means that they cannot be recycled and do not break down in a landfill, not to mention that the harmful chemical process pollutes waterways. In the end, these textiles have an environmental impact sadly similar to their conventional counterparts. On the positive side, most conventional textiles materials are sourced from endangered rainforests. Though they aren’t perfect, eco textiles do succeed in more sustainable sourcing. H&M is one of the largest fashion brands, with more than 4,433 retail locations worldwide and nearly 50 online markets. Its Conscious Exclusive line is a way to experiment with and scale-up sustainable technologies that otherwise get little traction from limited boutique markets. Despite H&M’s ninth consecutive sustainable line, critics still argue that experiments with food waste do not address the major environmental problems with fast fashion and that these distracting pineapple gimmicks are just that — gimmicks. According to the U.N. Framework Convention on Climate Change, the fast fashion industry contributes approximately 10 percent of all greenhouse gas emissions and consumes more energy than the aviation and shipping industries combined. The report said that the fashion industry produces 20 percent of all waste water, and 85 percent of textiles end up in landfills. More than just the harmful sourcing and toxic processing of fabrics, fast fashion culture is highly problematic in terms of the quantities of materials produced, purchased and disposed of. According to the World Resource Institute, the average consumer bought 60 percent more clothing between 2000 and 2014 than previous years and had each item for half as long. Relevant Magazine added that the average article of clothing is only worn five times before it is discarded. Both responsible for and responding to these trends, fast fashion companies like H&M aren’t making clothes to last, but instead to be trendy, cheap enough to be disposable and in quantities that seem endless. There is plenty to criticize about fast fashion and companies’ feeble attempts at sustainability; however, the size and scale of H&M makes it an important ally and trendsetter in shifting the market toward sustainable fashion. The Swedish company has made serious commitments toward sustainability goals that could equate to substantial shifts because of its size. For example, H&M claimed that 57 percent of all its clothing comes from recycled or sustainable sources, and it has set a benchmark goal to get to 100 percent by 2030. In addition, many H&M retail stores have recycling programs where customers can bring in old clothing to be recycled, reused or disposed of properly. Global Citizen also reported that H&M promises to eliminate problematic plastics from its supply chain by 2025. Can eco textiles save fashion? Textiles made from pineapples and oranges are fun and stylish, and they get people talking. As Vogue explained, if your clothing was made from pineapples, isn’t that the first thing you would tell your friends when they compliment your outfit? Despite the sustainable sourcing, though, critics argue that there is simply not enough leaves from pineapple harvests to make this a scalable solution to even address unsustainable fashion within H&M’s own markets. It is only a small bandage and cute talking point. There is still a lot of work to turn shoppers and companies into conscious consumers and producers. Before the general public will consider or prioritize the ethics of their clothing, it has to be the right aesthetic and price point to even get their attention. Even if the eco textiles are not sustainable at a global scale or making a huge impact, a fashion giant like H&M showing public commitment and getting people talking sends a message to consumers around the world and amplifies the conversation. It also sends a message to designers and experimental sustainable fashion start-ups that large manufacturers are paying attention, committing to sustainability goals and looking to their inventions for the next big thing. That motivation alone could be enough to shift the future of the industry. For H&M's ninth Conscious Exclusive line, it has turned to eco textiles made from fruit waste. The eco textiles do make use of materials that would otherwise end up in landfills, but they still have many downfalls. Fast fashion as a whole is a huge contributor to greenhouse gas emissions. While it has many drawbacks, H&M is setting an example by making an effort in sustainability. As eco textiles grow in popularity, there is hope they will improve the industry in the future.